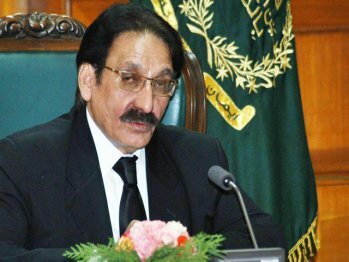 ISLAMABAD: Salvation and survival of the country rest upon rule of law and the implementation of the constitution, Chief Justice of Pakistan Justice Iftikhar Muhammad Chaudhry said on Saturday. Urging lawyers to abide by the constitution and the law, the chief justice said, “There is no oath which has to be administered to the advocates of the Supreme Court but it should be their aim and effort that they shall abide by the constitution and the law. As you know the honourable judges of the Supreme Court and high courts are subject to the code of conduct and they are bound to act only under the constitution and not to take order from any unlawful authority or take oath other than under the constitution”, the chief justice said. He said all bar members should give the court the same commitment and should refrain from being influenced by any ‘incentive’ to support acts in contravention of the constitution. Around 53 new advocates, 39 from Punjab, seven from Sindh, one from Balochistan and six from Islamabad, were enrolled as advocates of the Supreme Court.